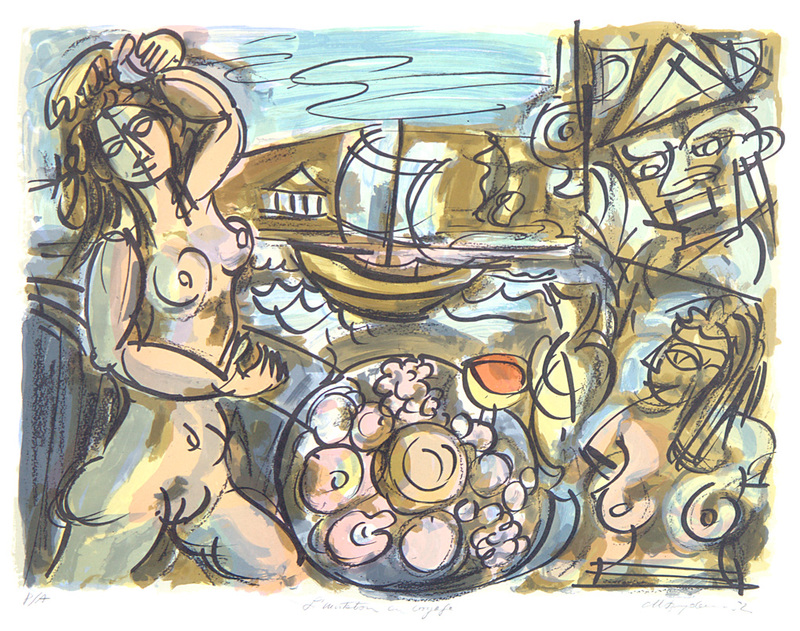 This stylized lithograph is a signed artist's proof from a commission for a corporate client created by Venezuelan raised, New York based artist Marius Sznajderman (1926-2018). It incorporates various elements which recur in the artist's work, from the the two nudes in the foreground, a mask and a background scene in a harbor, to a plate of prepared food. The printe is framed in a 3/16" wide contemporary gold metal frame and is ready to hang. Dimensions: 22" x 30" x 1.0"
Van delivery included with price within 60 miles of Milford, NH. Shipping not included in sale price. Crating fee ($150) and freight forwarding may apply (TBD).